Even in my shock and despair, it's impossible for me not to comment on the death of James Gandolfini. But what can I say? He was a brilliant actor, but that's nothing new. Still, it bears repeating. And yet, let me something more--something bolder: He was one of the best actors ever seen. Easily as good as Brando, Nicholson, Dean, Pacino, Streep, De Niro, Tracy, Hepburn, Stewart, Garbo, Bogart, and Cagney. This is merely a simple sampling of it all. You can easily see how all of this must have taken a great deal out of this gentle actor. I met James Gandolfini very quickly in 2002. I was staying near Little Italy during a visit to NYC in 2002. I got out of my hotel room in the early afternoon, and rounded the corner to Mulberry Street, and saw a film company shooting. Having been a fan of the show, my mind quickly said: "Could this be what I think it is?" And it was. The Sopranos team was shooting an episode on that street, and I could hardly believe my eyes. My first clue was the presence of Vincent Curatola (who played NYC boss Johnny Sack). The second was the (as yet unrevealed, on the show) presence of Frank Vincent. I had always wondered if he would eventually be on the show, and there he was, as the venal Phil Leotardo. And then out of a red-painted doorway came Gandolfini, and I was floored. This was a true fan moment for me--and most people who know me will tell you, I am a slobbering fan of few things. But I could not tear myself away from this moment. I was lucky, too, because shooting had concluded, and for Gandolfini, this meant a simple walk home to his Manhattan space. He was very magnanimous to his fans, stopping for autographs and pictures. I ran up and boldly told him: "James, congratulations on your new negotiations." He had recently upped his HBO price to a million dollars an episode. "Can I tell you, you're giving the best performance ever seen on TV. You're worth every single penny." He shook my hand and said "Thank you." It was a big meathook of a hand, and I really got the sense of how imposing the character Tony Soprano was. I watched him as he stopped to pet a dog owned by a Little Italy denizen (and, knowing how much Tony loved animals, this struck me). And there I got an extreme sense of who Gandolfini--and by extension, Tony Soprano--really was. I've met many famous people in my life...but this was easily the most memorable instance. And, somehow, the most profound. I ran into James Gandolfini one more time, when I was living in NYC in about 2009 or so. I was coming home to my Village apartment, in a terrific rainstorm, after seeing Anne Hathaway play the lead in Shakespeare's Twelfth Night in Central Park. I was on Sixth Avenue, and I saw him as he was crossing the street. He was coming to the aid of some older ladies, bogged down with packages, as they were trying to hail down a cab. He immediately stepped up and did something that was very difficult in the Manhattan rain: he hailed down a cab. Of course, no one was going to fail to stop for him. The ladies got in, and he paused for some photographs. I stayed where I was, getting soaked in the rain, and watched him as he saw them off and then crossed back 6th Avenue. I considered rushing up to him, yet another fan who wanted even a single moment of his time. But I could not bring myself to do it. As much as I loved him, I knew he wanted his time alone. And so I watched him as he went on his way. This moment remains to me bittersweet. When I think of it, I want to cry. I'm crying now. 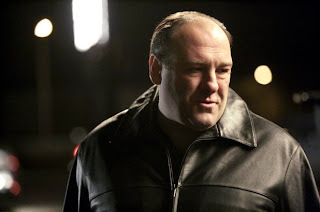 He was obviously an artist who, in that one role as Tony Soprano, and in his many movie roles, actually gave it his all. He gave every single bit he had.